Even 70 years after Independence, it appears that the Gujarat government continues to view Adivasis through the racist lenses of British colonisers. 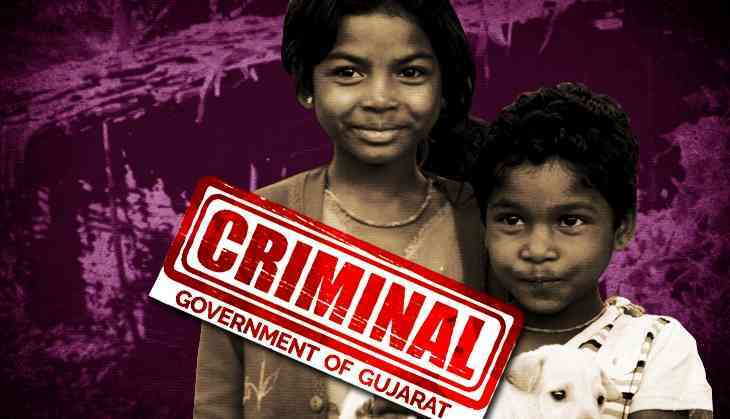 A website of a department of the Gujarat government has referred to the tribal Bhil community as "black" and insinuated that they indulge in "criminal" activities. Bhils are the largest Adivasi community in Gujarat and form around 46% of the state's tribal population. They are mainly concentrated in the districts of Dangs, Bharuch, Surat, Vadodara, Panchmahals, Sabarkantha and Banaskantha. The government body in question is the Tribal Research and Training Institute (TRTI) run by the Gujarat government's Tribal Development Department. The TRTI's website contains a primer on every major Adivasi community in Gujarat. The article on Bhils is divided into several sub-sections, one of which is titled "New Means of Communication". In this section, TRTI claims that Bhils use mobile phones for carrying out crimes and formulating criminal strategies. "Mobile phone is used for many purposes-giving information, getting information, finding jobs, finding husband/wife, information about illness, place of treatment, about accidents, collection of relatives, caste people, and for crime/criminal strategy," TRTI writes. 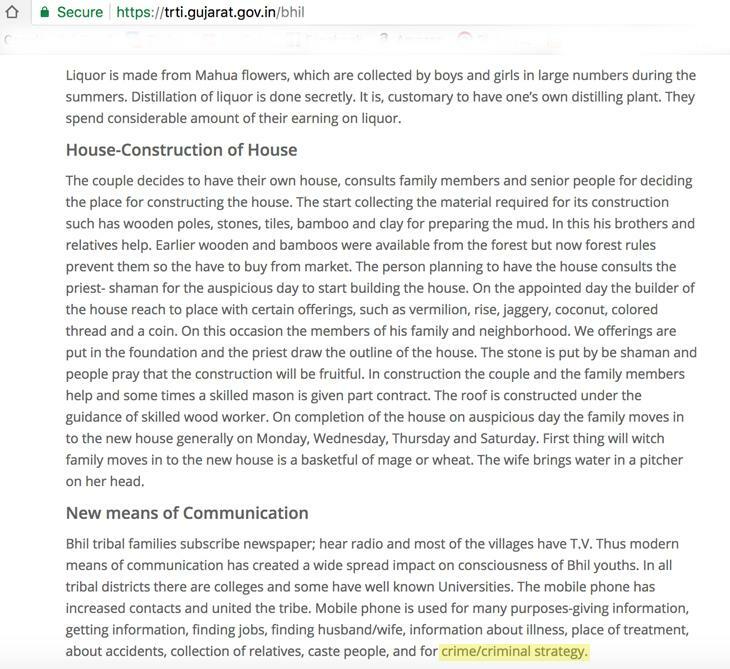 This is given in the TRTI’s website https://trti.gujarat.gov.in/bhil, which has a “gov.in” domain name, clearly showing that it is a government website. The TRTI’s view is hardly different from the British classification of Bhils as a “criminal tribe”. 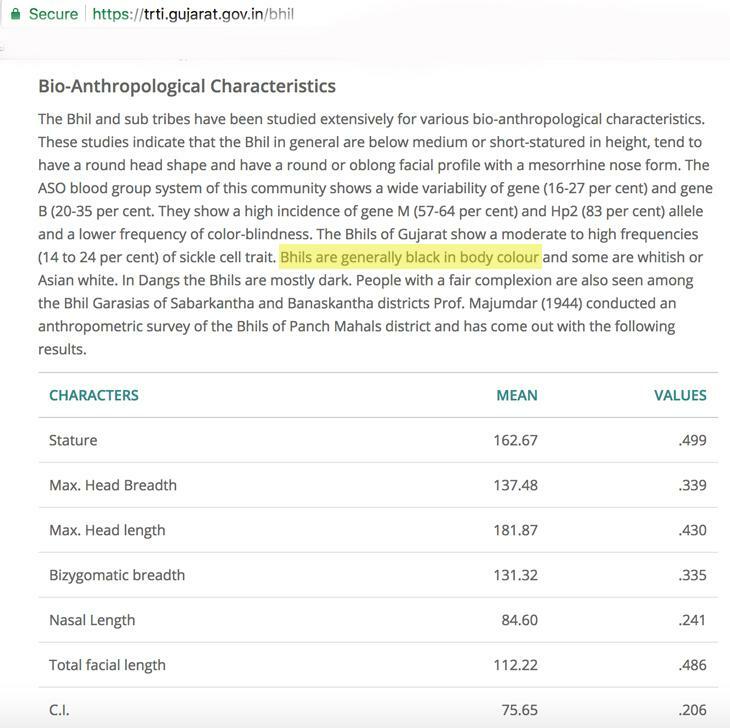 In another section titled "Bio-Anthropological Characteristics", TRTI further uses racist vocabulary by saying that "Bhils are generally black in body colour". The section goes on provide a table on the average height, length and breadth of the head, bizygomatic breadth (distance between the two cheekbones), nasal length and facial length of the Bhil community. Dr Gaurang Jani, a sociologist teaching at Gujarat University, said “In my opinion, it is a social crime to speak of Bhils or any other tribal community in this manner. This is insulting not just to the tribe, it is insulting that the government sees its own citizens this way”. “In a civilised society, no one says things like a community is of ‘black colour’. Why don’t they write that Bhili is the second most spoken language in Gujarat?” he told Catch. Like Jani, Ahmedabad-based political analyst Prakash Shah feels that the most disturbing aspect of the website is that it shows how the government views citizens. “The use of such categories and methods shows that the government views tribals as subjects and not citizens. This is absolutely wrong,” he said. In the essay, TRTI also cites a colonial scholar to allege that Bhils have "an inordinate thirst for liquor". The report states, "Though liquor is banned in Gujarat, it is generally consumed in tribal communities. It has important place in the way of life of Bhils. On each social occasion the drinking is done, it is offered to guests and friends. Erskine wrote in 1908, 'The principal failing of the tribe is inordinate thirst for liquor, which is very much in evidence on all occasions…Their quarrels begin and end in drinking bouts' (1908, 231)'". Adding its own observation, TRTI says that Bhils distill their liquor in secret and spend a considerable part of their earnings on alcohol. The work cited by TRTI is KD Erskine's Gazetteer of Udaipur State (1908) which deals at length with the Bhil community and contains several derogatory references to the community. For instance, Erskine describes them as “black and ugly” and having “predatory and quarrelsome habits”. He wrote that Bhils “lift cattle and abduct women" and “when their feelings have been aroused, they are inclined to take the law into their own hands”. Mittal Patel, who works with Vicharata Samuday Samarthan Manch (Denotified Tribes Collective Platform) says that the government is following a colonial way of looking at tribes. “It is absolutely wrong to speak of tribes in this manner. It reflects a deeply biased and colonial viewpoint,” she said. “Instead of perpetuating such biases, the government should use such websites to talk about welfare measures for tribals,” she added. Vikas a member of the National Alliance Group working with denotified tribes, says that such colonial mindset acutely affect development work among tribals. “Much of the data that the government has dates back to the colonial era. Governments in Independent India didn’t do much research on tribals. Therefore they ended up replicating the same biases,” he said. According to Vikas, the most serious manifestation of this is in policing and law enforcement. “Several retired bureaucrats and police officials tell as the even the police manual refers to criminal tribes. Police officials are told that they need to know about these criminal tribes for effective law enforcement in their areas. This is extremely harmful and leads to harassment and stigmatisation of these communities,” Vikas said. Jani, however, feels that it isn’t just about a colonial mindset, such biases exist in society at large. “What is written in the website reflects how the government and society view tribals. These biases are deep-rooted in Gujarati society,” he says. “Despite Bhili being the second most spoken dialect, it is not part of the school curriculum in Gujarat. No textbook even has the ‘a’ of Adivasi in them,” he said. Catch contacted TRTI through email as well as phone but received no response. During the colonial period, anyone who opposed British colonial expansion was perceived as a potential criminal. Therefore many communities who took up arms against the British were labeled as criminal tribes. Bhils were placed in this category as they carried out a series of rebellions against the British and their ally, the Gaekwad Maharaja of Baroda, throughout the first half of the 19th century and also during the revolt of 1857. The Act remained in place until it was repealed in 1949 and denotified in 1952. But the Habitual Offenders Act that came in its place in 1952 and it provided space for re-stigmatising of erstwhile criminal tribes. But as the experts cited above stated, the notion of criminal tribes got internalised in society, especially among law enforcement agencies. 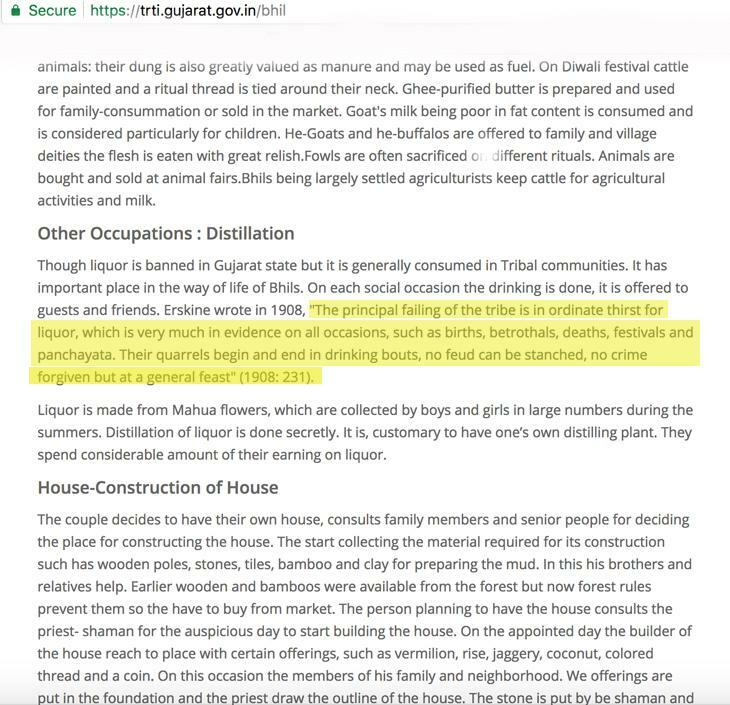 The TRTI website’s content clearly shows how this deep-rooted bias continues to shape the government’s view of Adivasi communities.